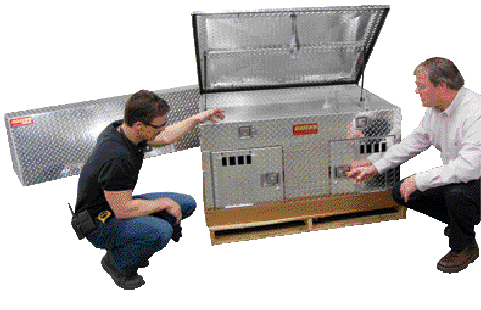 Owens Products fabricates dog boxes of heavy-duty diamond tread aluminum. “Punched parts are highly visible in the finished product,” says plant manager Joe Long (left), “so punched features must show well. And, the components are assembled and welded together, so sheared and punched parts must be flat and precise. We can’t tolerate uneven, rough edges or burrs.” Shown here along with Long, inspecting a fabricated dog box, is Mate sales engineer Gary Troxell. How is it possible to make millions of punch hits without having to replace tooling , and with very little maintenance, over a span of seven years of fabricating sheetmetal parts? And, more importantly, what impact does that kind of punch-press tool life have on productivity and the bottom line? Certainly Owens Products knows the answers to those questions, where fabricating made-to-order sheetmetal products means punching a lot of short runs. Many of the company’s products are comprised of just six or seven punched components, and with many products and variations, there is frequent changeover in the turret press from one product to the next. The key to maximum productivity for these short runs is to punch quickly, moving from job to job and minimizing setup time. Especially important is tool life, so that tools stay sharp and the turret press keeps punching without interruption for tool sharpening or replacement. Owens Products, Sturgis, MI, is well known for its sleek running boards designed for pickup trucks, vans and SUVs; it also manufactures vehicle toolboxes and elegant dog boxes. With a commitment to only the highest quality fabricating, this family owned business has grown steadily for more than 40 years. 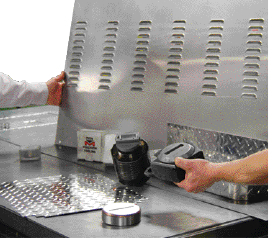 One of the keys to Owens Products’ success is a well-managed punching operation in a lean-manufacturing environment. The press runs a servo-driven ram, making high-speed and low-noise punching possible by controlling acceleration and deceleration of the ram drive and by controlling ram power, all during the punch stroke. This servo hydraulic design, when outfitted with the Mate Marathon tooling, makes for high precision processing with accuracy to ±0.1 mm. The punches are produced from specially formulated and controlled M-2 high-speed steel to offer good wear resistance while maintaining accuracy in shearing parts and punching accurate holes at high press speeds. Their near polished punch flanks and minute back taper reduce friction of the tool components, eliminating punch build-up (galling) and improving stripping, while extending tool life. Article submitted by Mate Precision Tooling, Anoka, MN: 763/421-0230; www.mate.com.